My Story - Matthew D.
My life before surgery was a constant battle. 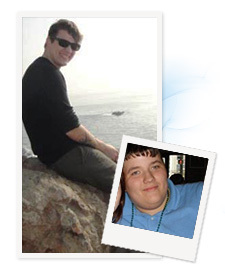 I had been obese since childhood, and by the time I was a senior in college I weighed nearly 450 pounds. People would constantly shout at me on the street, and I was even egged once by strangers. I felt like I could not leave the house and my anxiety became so bad, I soon didn't. I had a couple of friends but I chose to push people away because I was ashamed of how I looked. I was sluggish and slow and could feel that something was coming. For my size I was in decent health but it was rapidly declining. I was pre-diabetic and had terrible sleep apnea, yet I refused to get help. I had tried getting a personal trainer and had tried all of the diets, but I needed that "big" change. I needed something drastic in order to shock my psyche back into reality. By the time I went into Barix I had full-blown diabetes and was getting little to no sleep every night. I was an absolute wreck and at 22 years old, on the brink of death. Weight loss surgery was something that was always in the back of my mind growing up so obese, but I always thought I would be able to lose the weight before it came to that. There is this stigma with weight loss surgery that it is the easy way out and that simply isn't the case. I struggled on my own for years until I finally came to terms with the fact that I truly needed help and couldn't do it on my own. My experience at Barix was remarkable. Everyone was so kind, and after the informational session I felt that I was going to be taken care of. There was a bit of a hesitation at first because Barix does so many surgeries that I was afraid it would be a "factory-style" procedure where you are treated like parts on a conveyor belt instead of an actual person. I was so thankful that this wasn't the case and the doctors and nurses were exceptional in making me feel comfortable and safe. The nutritionist especially went above and beyond in order to make sure that I knew the risks and that I knew what needed to be done post-surgery. It's such a daunting and long road, and she was great in helping me realize how I was to retrain my brain in order to eat. My whole life has changed. After undergoing extensive plastic surgery (which I highly recommend) it is as if I am a new person. I've discovered a true passion for fitness (which I still can't believe) and can do everything and more. I've become more social and outgoing and I'm able to do all of the things I was too afraid to do. And as silly as it sounds, I can actually wear people clothes now. I will never forget the first time I was able to walk into a clothing store and buy something off the rack. It was thrilling. Same goes for the first time I put on a size “small.” Going from 3XXX to a small is unthinkable logically but I did it, thanks to Barix*. What would you tell someone considering Barix Clinics? Gastric bypass is not an easy way out. It is a permanent and forever change that you have to be ready for. I put in time at the gym 6 days a week in order to lose and maintain my weight. It's not about sipping protein shakes and sitting on the couch. There are certain things that I wish I still had (all of the ice cream I could eat, for example), but the logical part of my brain knows that it was a food addiction talking and I'm a million times happier thin than I was pigging out on ice cream at 430 pounds.